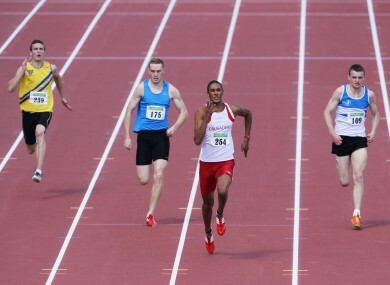 Stephen Colvert, second from right, powers clear to win the men's 200m title. STEVEN COLVERT’S OLYMPIC challenge ended in bitter disappointment on day one of the Woodie’s DIY Senior Track and Field Championship in Santry. With tomorrow’s qualification deadline leaving no margin for error, the Crusaders athlete ran an “A” standard time of 20.40 in the men’s 200m heats — only to see it disallowed for wind assistance. Times recorded with a wind speed of more than 2 metres per second do not count towards qualification, and the wind in Morton Stadium measured 3m/s during Colvert’s run. The 21-year-old bounced back in the final to win the national title ahead of Irish youth record holder Marcus Lawlor and Dara Kervick but his time of 20.78 was more than two-tenths of a second outside the 20.55 needed to send him to London. In the women’s 200m, Irish 400m record holder Joanne Cuddihy benefited from the wind to win in 23.15, one of her fastest ever times over the distance. Ferrybank’s Niamh Whelan (23.62) and Steffi Creaner (23.71) finished in second and third. Marathon specialist Maria McCambridge won the women’s 5,000m in 16:02.52 while the men’s 10,000m went to Brian Maher in 30:17.06. In the field events, London-bound Tori Pena won the national pole vault title with a height of 4.35m while Irish record holder Kelly Proper won the long jump with 6.33m. Email “Mixed emotions for Colvert as National Championships get underway”. Feedback on “Mixed emotions for Colvert as National Championships get underway”.